Renew or extend your Watchguard Firebox T30 or T30-W firewall - WatchGuard offers 8 security subscriptions to extend your network protection plus Standard Support for technical support, device warranty and maintenance. It is important to keep your WatchGuard Firebox T30 Firewall updated to cover you against the latest threats. Renew or extend your subscriptions today. Call us today for the best WatchGuard Renewal Deals available! 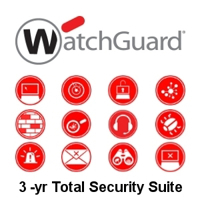 WatchGuard 3-yr Total Security Suite Renewal/Upgrade for Firebox T30 including Gateway Antivirus, Application Control, WebBlocker, spamBlocker, Network Discovery, IPS, Reputation Enabled Defence, Data Loss Prevention (DLP), Dimension Command, APT Blocker, DNSWatch, Threat Detection and Response, and Gold Support. WatchGuard 3-yr Total Security Suite Renewal/Upgrade for Firebox T30-W including Gateway Antivirus, Application Control, WebBlocker, spamBlocker, Network Discovery, IPS, Reputation Enabled Defence, Data Loss Prevention (DLP), Dimension Command, APT Blocker, DNSWatch, Threat Detection and Response, and Gold Support. 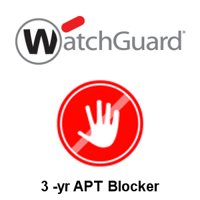 WatchGuard Security Suite Renewal/Upgrade 3-yr for Firebox T30 including Gateway Antivirus, Application Control, WebBlocker, spamBlocker, IPS and Reputation Enabled Defence as well as 24x7 technical support. WatchGuard Security Suite Renewal/Upgrade 3-yr for Firebox T30-W including Gateway Antivirus, Application Control, WebBlocker, spamBlocker, IPS and Reputation Enabled Defence as well as 24x7 technical support. WatchGuard 1-yr Total Security Suite Renewal/Upgrade for Firebox T30 including Gateway Antivirus, Application Control, WebBlocker, spamBlocker, Network Discovery, IPS, Reputation Enabled Defence, Data Loss Prevention (DLP), Dimension Command, APT Blocker, DNSWatch, Threat Detection and Response, and Gold Support. 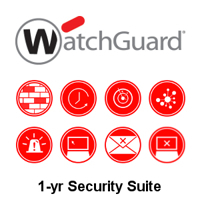 WatchGuard 1-yr Total Security Suite Renewal/Upgrade for Firebox T30-W including Gateway Antivirus, Application Control, WebBlocker, spamBlocker, Network Discovery, IPS, Reputation Enabled Defence, Data Loss Prevention (DLP), Dimension Command, APT Blocker, DNSWatch, Threat Detection and Response, and Gold Support. WatchGuard Standard Support Renewal 3-yr for Firebox T30, providing hardware warranty, software updates and technical support. 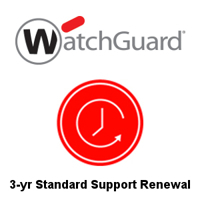 WatchGuard Standard Support Renewal 3-yr for Firebox T30-W, providing hardware warranty, software updates and technical support. WatchGuard Security Suite Renewal/Upgrade 1-yr for Firebox T30, including Gateway Antivirus, Application Control, WebBlocker, spamBlocker, IPS and Reputation Enabled Defence as well as 24x7 technical support.